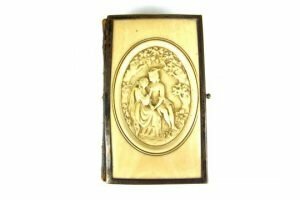 A Victorian book of Common Prayer, bound in leather with ivory boards mounted in white metal, the front board finely carved in relief depicting a seated couple within a rural setting. 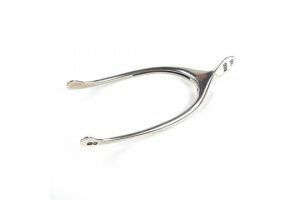 An Edwardian pair of novelty silver sugar tongs of wishbone form, with a sprung hinge, mark of Henry Stuart Brown, London 1901. 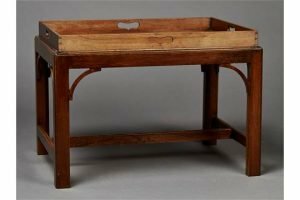 A 20th Century George III style mahogany tray-top coffee table with a raised gallery, on chamfered block legs. 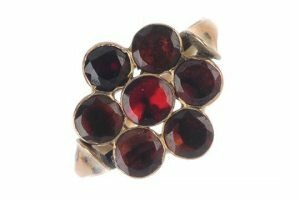 A garnet floral cluster ring, the circular-shape garnet cluster to the tapered shoulders and plain band. 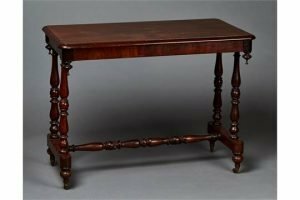 An early Victorian mahogany occasional table, the moulded rectangular top on four ring turned supports and horizontal brackets, terminating in turned feet with brass caps and castors. 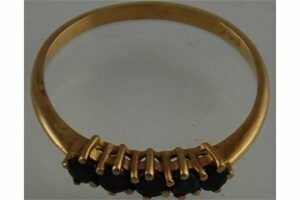 An 18ct gold late Victorian mourning brooch, the shaped square brooch with fleur-de-lys to each corner and a spherical bead to the centre, with woven hair panel to the reverse. A five stone sapphire ring, claw set in a 9 carat yellow gold band. 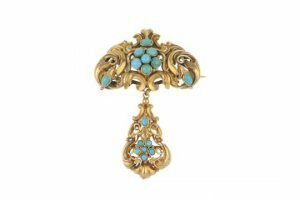 A late 19th century gold memorial turquoise brooch in two sections, the upper section with scrolling acanthus leaves with oval-shape turquoise cabochons set in a central cluster, to the small glazed hair panel to the reverse. 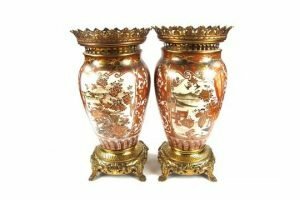 A pair of Japanese Kutani porcelain vases, late Meiji period. Painted in iron red and brown with gilt highlights and decorated with panels depicting rural landscape scenes with figures, birds and flowers. Later applied with 20th century gilt brass mounts to both the rims and feet. 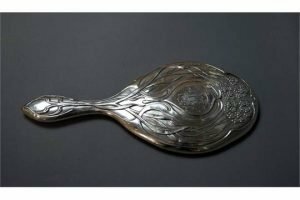 A hallmarked-silver backed hand mirror, with relief designs. Birmingham assay, 1902. 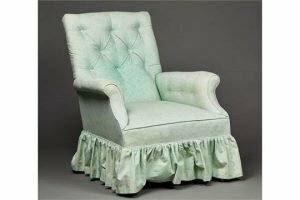 A late Victorian buttoned back scroll armchair, the turned tapering walnut legs with brass caps and china castors. 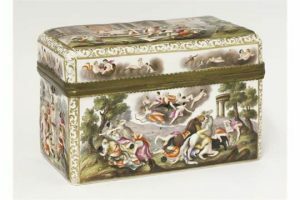 A Capodimonte-style porcelain Casket, late 19th century, with moulded panels depicting classical scenes, with scroll borders, gilt mounted. 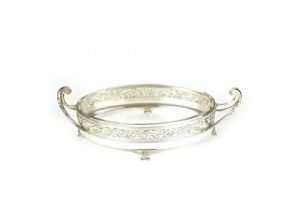 A German WMF Neo-Classical silver plated bowl of oval form, with a clear glass liner, the exterior embossed with a wide band of leaves and berries enclosed within a reeded border, terminating with scrolling acanthus handles and supported on four foliate decorated feet. 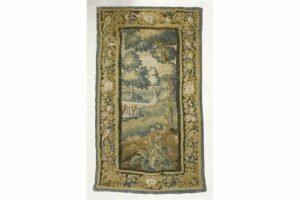 An Aubusson tapestry, late 17th century, centred with a heron standing in a river landscape, the border decorated with birds, flowers and panels. 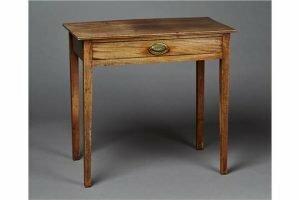 A George III mahogany side table, fitted with a single drawer, on tapering block legs. 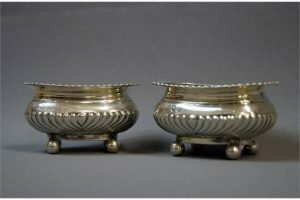 A pair of hallmarked-silver open salts. London assay, 1895. Total weight approximately 106g. 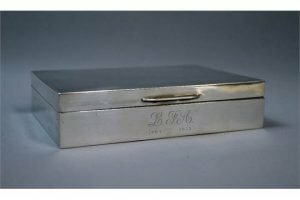 A hallmarked-silver two-section cigarette box, with machine-turned detail. 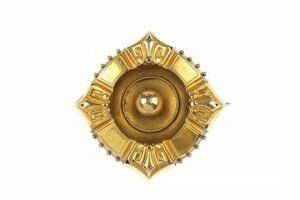 Birmingham assay, 1946. 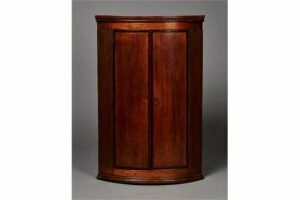 A George III oak bowfront hanging corner cabinet, fitted with a pair of mahogany crossbanded doors, flanked by fluted sides. 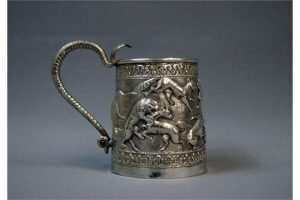 A white metal Indian tankard, relief decorated with a cobra form handle. Total weight approximately 125g. 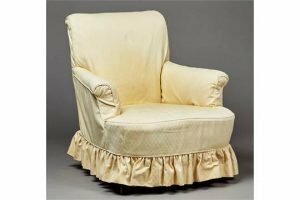 A mid-Victorian scroll armchair with loose cotton covers, the turned walnut front legs with brass caps and castors.